A roof is an important part of your structure, and needs to be well taken care of. With proper maintenance, it can last you for many years. When it comes time to install a roof on your commercial project, there are a few key things to keep in mind. It is crucial to pick the right kind of roofing for the project you’re doing. Can-Sky Roofing offers five main types of materials to suit your needs. 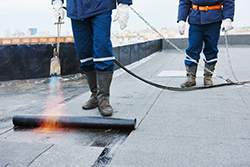 Built-Up Roofing (BUR) – The BUR is generally made up of four plies of different reinforcing felts laminated together with liquid hot asphalt. This is then surfaced with ballast. The felts provide strength and stiffness, the asphalt acts as waterproofing, and the ballast protects the surface from the sun. The ballast also acts as a protectant from being walked on, and provides fire resistance. It is one of the most commonly seen roofing types for both new and existing roofs, and is the oldest flat/low slope system. It has the longest lifespan when taken care of properly. Modified Bitumen (Mod-Bit) – Modified bitumen is made of asphalt bitumen and enhanced with a copolymer, either atactic polypropylene (APP) or styrene-butadiene-styrene (SBS). APP is a plastic copolymer that makes the asphalt bitumen more flexible and elastic. SBS is a rubber copolymer that provides even more flexibility and elasticity at lower temperatures, and is therefore preferred in colder climates. Ethylene Propylene Diene Terpolymer (EPDM) – EPDM is one ply of a synthetic rubber attached together to form the roof. The material of EPDM can expand and contract repeatedly while still maintaining its original size. Carbon black is the main substance in black EPDM. EDPM roofing has progressed and now there is white EPDM. Opinions differ as to which variation performs better. EPDM does not to well when in contact with oil or fat as it will cause a break down of the material. Polyvinyl Chloride (PVC) – PVC is a single ply roofing material. It is hot-air weldable, and remains so during its entire service life. The PVC material is often mixed with other compounds to add other properties to the roof, such as UV ray resistance, or fire resistance. PVC roofing is available in many colours. Thermoplastic Polyolefin (TPO) – TPO roofing is very similar to PVC roofing in that they are both single ply, hot-air weldable roofing materials. TPO and PVC are not able to be welded with each other however. Picking the right contractor for your job is important. Our staff have over 30 years in the roofing industry. Since our establishment in 2003, Can-Sky Roofing has completed over 1000 projects, bringing all our experience to each job we do. We specialize in flat and low-slope roofing, and offer preventative maintenance, repair, and replacement. Once your roof is installed, it is key that you take good care of it. If you’re able, performing routine inspections of your roof will help you notice any irregularities or damage that needs to be addressed. If you can’t perform the inspection yourself, or if you have our preventative maintenance package, we will be able to come and check the condition of the roof for you, along with ensuring any skylights, gutters, and other accessories on your roof are in excellent condition as well. 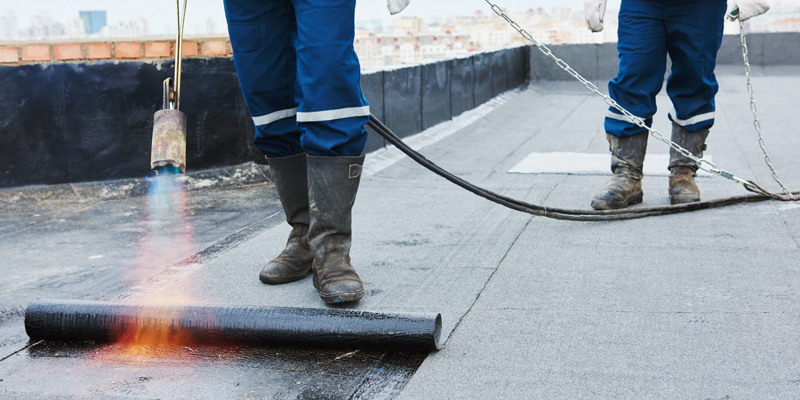 Follow your contractor’s advice when it comes to your roof. They are the experts, and have been trained to find problems and give you the best service and results. They can advise if a repair is worthwhile on an old roof, or if a full commercial roof replacement is the best approach. When you have your roof installed, it is up to you to do what it takes to ensure it remains in the best shape it can be. This means making sure your roof is prepared for extreme weather changes and storms by having your contractor perform an inspection to let you know that your roof can withstand the season. Also, perform regular inspections to check that everything is in great condition. At Can-Sky Roofing, competency and efficiency are at the core of our values. For emergency repairs, contact us at 416-991-6783. For all other inquiries, including a free estimate for your roofing project, call 416-763-5131. For a complete overview of our services, visit us online. Copyright 2017 - Can-Sky Roofing and Sheet Metal Inc., All Rights Reserved. Web Development by SGM Design Group.